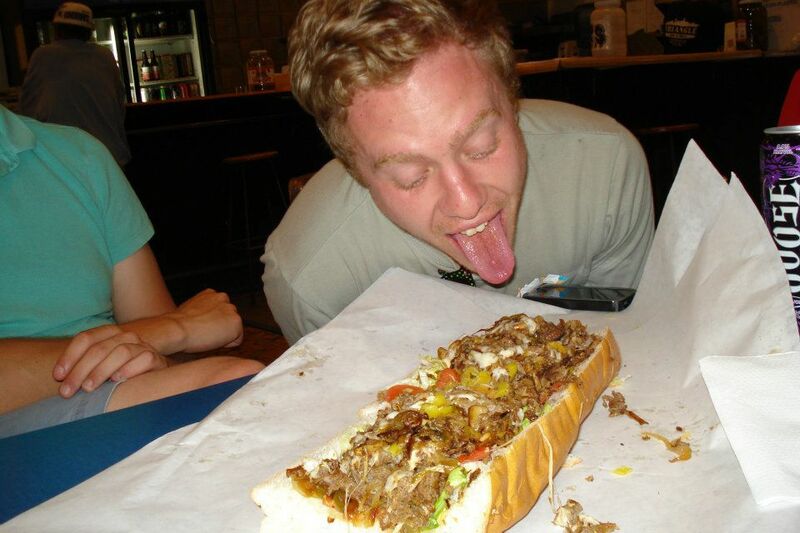 Jerry likes his hoagies sloppy, at least that's what he tells his woman. The Triangle is one of those Pittsburgh institutions that might just slip under your radar if you aren't a keen food fanatic. They've been running out of a dark and dirty bar in Swissvale for over thirty years. This is not a foodie joint - the lack of blogger reviews and general knowledge amongst my generation indicate that it is a well kept Pittsburgh secret that appeals to the older blue collar crowd. The subs are gigantic. No one was able to down an entire battleship (23 inches.) I tried the fried boloney, the Italian and the cheese steak (pictured above with banana peppers and Joose!) The bread was soft and fresh, the meat was pretty good and the vegetable to meat/cheese/bread ratio was great. I think a lot of sub places give you too much bread, resulting in a crappy bread sandwich. I loved the cheese steak and the Italian, but the fried baloney was the most original and interesting sub I tried. Just dripping with cheese and hot baloney, I am currently salivating as I recall the sweet greasy deliciousness. This bar is not in the greatest neighborhood in the world. The Triangle is located right in the middle of Rankin, Braddock and Swissvale. However, as a result, the drinks are cheap as sin. For $2.75 you can get any 24 oz beer you want. For $2 you can get a Joose, which is basically a generic 12% alcohol Four-loco energy drink. Joose will ruin your evening. One of our guests had three and he was basically shouting nonsense at the top of his lungs and smashing glasses. Luckily, because of the venue, he still wasn't asked to leave.